Tupiocoris notatus (Distant) (Hemiptera: Miridae) is commonly known as the “suckfly” and it is a leaf-feeding, sap-sucking bug with a wide distribution in the southern United States. T. notatus has been recorded as a tobacco pest in the southeastern US since the late 1800, and in some accounts of Florida farmers, it was described as “the most serious insect with which they have to contend” (Quaintance, 1898). 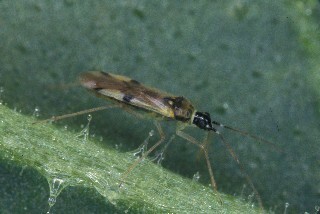 Currently, the suckfly is considered a minor pest that may periodically become abundant on flue-cured tobacco in the late season. Both nymphs and adults damage the leaf by feeding on leaf cell contents, causing leaf chlorosis and can cover leaves with a black, gummy excrement, which may seriously affect the curing process. The adults are 3–4 mm long (about 1/8 inch), light brown color and highly mobile. Females have a wider abdomen and their long ovipositor, or egg laying devise, can be observed under magnification. Females insert their elongated, paddle-shaped eggs (0.6–0.7 mm long) into the leaf veins (Van Dam & Hare 1998). Males look similar to females, but are skinnier and their abdomens are flatter, particularly in lateral view. The nymphs emerge 3–5 days after oviposition (at 28 °C). There are four or five nymphal stages (Quaintance 1898, Howard 1900), which altogether last about 2 weeks. Nymphs are usually yellowish green in color with reddish eyes and are also highly mobile. The current scientific name of this pest is Tupiocoris notatus, however it has also been described as Dicyphus minimus and Cyrtopeltis notatus in other publications. It is possible that the umbrella term “suckfly” covers several similar species that can occasionally attack tobacco, since reports of others closely related species in wild relatives of tobacco and other solanaceous plants are known. 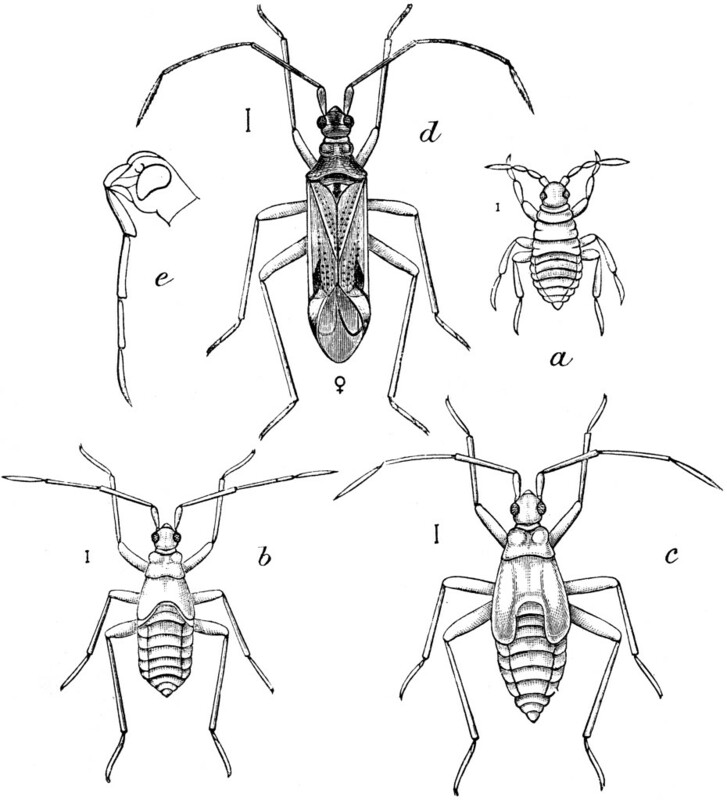 Life stages of Tupiocoris notatus. Image via Quintance 1898. Tupiocoris notatus on plant. Photo via A. Kessler. Threshold and Management If necessary, suckflies may be controlled with insecticides on late-planted tobacco. Treatment should begin when 25 percent or more of the plants show readily visible signs of infestation (e.g., excrement and suckfly nymphs on underside of leaves). For specific chemical recommendations, consult the current North Carolina Agricultural Chemicals Manual. There is currently no information on organic control of this pest in the field, but we have controlled this pest in the greenhouse with the use of insecticidal soaps. Since eggs are buried inside the leaf, multiple applications may be needed to achieve adequate levels of control.